A five foot wide tarp is a dead useful thing to have around, for emergency use, hiding from the weather to cook or glass (above), or for a primary solo shelter which will force one to use good site selection and pitching techniques. 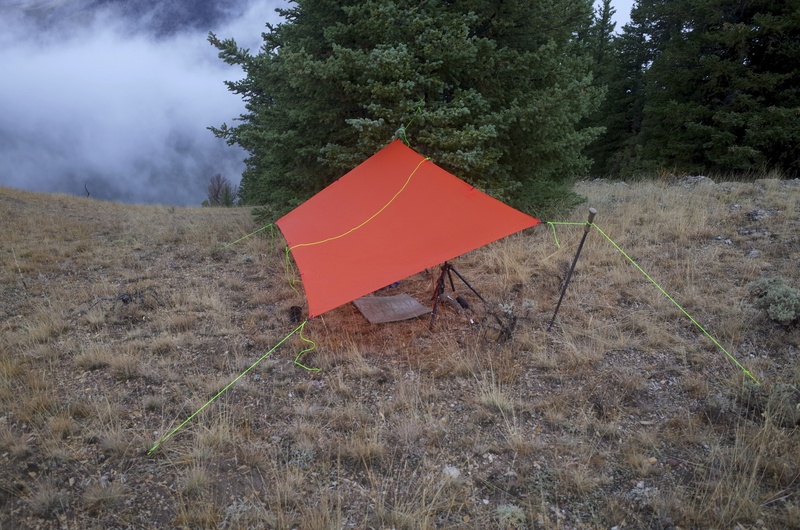 It’s also an excellent and relatively cheap and easy MYOG (make ya own geah) project. Why 5 feet wide? Most silnylons are between 62 and 58 inches wide per yard. Subtract between 1 and 2 inches for side seams, selvedge, and cutting the sides parallel and you end up with a tarp about 5 feet wide. Anything wider requires a lot more material and a large horizontal seam, which if you’re like me you’ll find challenging to keep straight and parallel. I let the pros make bigger shelters for me. For a 5 foot by 9 foot tarp you’ll need 3 yards of fabric, plus a little extra. Why a little extra? Because I highly recommend bonded and then sewn tieouts for these little tarps. So long as there is not a nick point for a tear to start silnylon is dead strong, and you’ll be amazed at the tension with which you can pitch it. Needle holes can serve as such a failure point, and one of the only out and out failures from the factory I’ve had in my professional gear testing life was on a silnylon tarp whose tieouts were sewn without any reinforcement panels, and with a too-large needle. One of the side guy points tore several feet along the stitch line under tension while pitching it in the back yard. Bonded reinforcement panels are simple with silnylon. You’ll need the extra bits of silnylon cut into triangles (I make 6″ by 6″ squares, then cut them in half), 100% silicone, mineral spirits, a brush, plastic grocery bags, and a few heavy flat bottomed objects. Use this technique on both the main tarp and the reinforcement patch. Let both dry for a few minutes, then press, weight, and let dry overnight. I put ten patches on this particular tarp; four in the corners, two centered on the short sides, and two each every three feet along the long edges. More than this is I think overkill. Center patches for tieouts can be handy, but aren’t necessary and take more work (they need to seam sealed after sewing). After the reinforcing patches have cured, sewing the edge seams is next. I roll the edge once, sew, then roll again and sew. 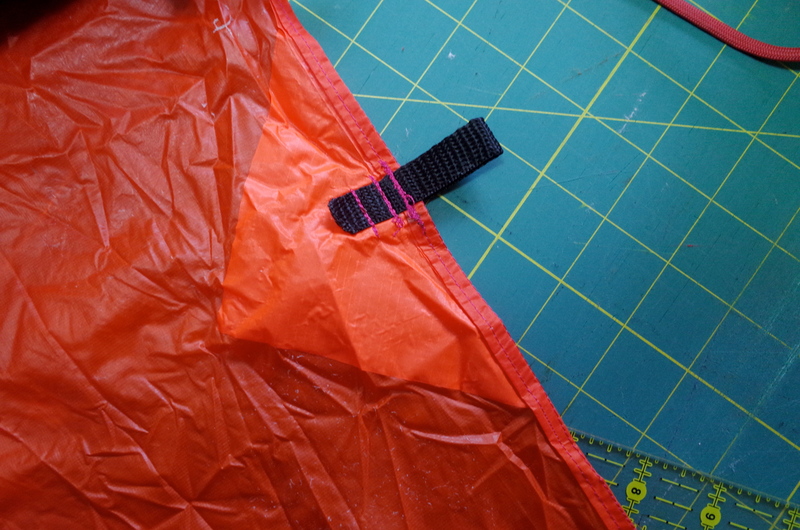 To keep the tarp as wide as possible these seams are as small as is practical, around 3/8″. Small needles and fine 100% polyester embroidery thread are more than adequate for this job. After the seams are finished, bartack on the webbing loops. I used 5/8″ polypro webbing, which is lighter and absorbs less water than nylon, and is more than strong enough. The tack on the seam is load bearing, and goes through six layer of fabric for strength. The secondary lines of stitching are for insurance purposes. I put linelocs on the corners for ease of use. It’s worth noting that not all silnylon is created equal. The good stuff will feel silky and have a substantial coating on both sides. The less-good stuff will be more crinkly and slicker. The reinforcements on this tarp were cut from sil I bought from Bear Paw Wilderness Designs, which did not seem to be good stuff. I reordered from Ripstop by the Roll, which was more satisfactory. Camping with such a small tarp is quite practical, even in bad weather, but requires the use of good pitching technique and when the wind kicks up, trees for shelter. I took this one on my sheep hunt last month, and on both evenings had to repitch during the night to get more protection from blown precipitation. Had I been more conservative from the start that would not have been necessary. After each repitch I slept well and myself and my gear stayed dry. The real value of a small tarp like this is as an emergency shelter. It will not take too many forced nights out (or planning nights without a sleeping bag) to make you realize that the condensation make mylar bivy sacks less than ideal. 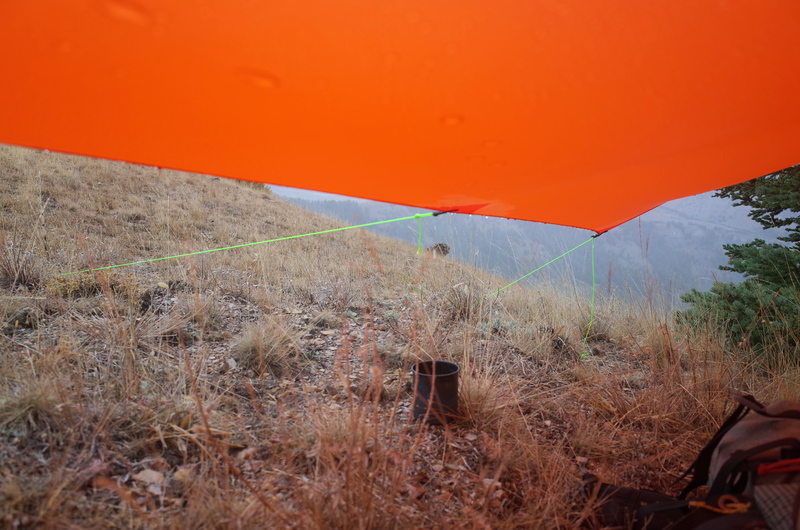 Better to have a tarp which can keep the wind off and keep you dry by allowing your clothing to breath. As such, making your 5 foot tarp out of bright fabric, for signalling purposes, is something worth considering. This tarp fits into a softball sized stuff sack and is therefore a practical companion for ski tours and other day outings when emergency shelter might make a big difference. For those who don’t care to build their own, quality options are available from Oware (50 dollars, basic tieouts) and Mountain Laurel Designs (100 dollars, deluxe tieouts). I need to fire up my mom’s sewing machine and start doing some projects. It’s a good first project because unlike packs a generic home machine won’t be stressed. On the other hand sil is slippery and a bit irritating to work with at first. As an alternative I have taken to using a sil-nylon poncho as my emergency rain gear and shelter. It can be a tad difficult setting it up if you are wearing it, but works a treat! The old Golite Poncho-tarp was a great option. Many of the current ones are a bit heavy/complex or poorly made. How much does this one weight?? We were considering having zpacks whip one up for us made out of cuben fiber so it could be super light. I’m glad I read your blog, this only makes me more sure we need one of these. Even to carry when backpacking with our tarp tent I think it could be really useful for changing under getting out of the rain, a quick lunch break, all that stuff! I live in Washington so sometimes it just rains all day. Thanks for the advice!!! Not sure (no working scale atm). Perhaps 8-9 oz with cords.